On hot summer days, now a distant memory, the Pearl District’s Jamison Square teems with activity. From miles around, the park’s wading pool attracts parents who bring their kids to cool their toes and survive the heat. Joyful shrieks of children splashing and frolicking in the water echo off the walls of nearby condos and fill the open space. When autumn arrives, the pace of activity slows. Pedestrians saunter through the square, holding on to the season’s waning moments of sun and warmth. Leaves turn golden, bathing the plaza with amber in the afternoon light. Streetcars rumble past on schedule, the metal of the steel rails screeching under the weight of the wheels. Sharply-dressed women strut by in heels, slowly, to make sure they are seen. Fit, toned joggers in short shorts and tight tees bounce along the boardwalk. Curious kids clamber up the park’s granite bear, testing their bravery as they climb to the top of the statue before leaping off, like chicks taking their first plunge from the nest. Toddlers wobble along the top of the tan stone wall that splits the square, their mothers leisurely following behind, pushing high-dollar strollers with one hand, and holding smartphones to their ear with the other. Benches surrounding the park fill up with friends, neighbors, and nappers. Amidst this activity, a new café sits on the northwest corner of the square, waiting to be discovered. The name on the door says Christopher David, Interiors | Floral | Café (CDExD). The shop is a unique concept, a multi-use space that combines the diverse interests and talents of its three owners: Chris Giovarelli (whose first and middle names adorn the door), an interior designer, Cosmin Bisorca, a flower and finance specialist, and Kevin Nichols, a former barista at Nuvrei and Water Avenue Coffee, who oversees the coffee side of the business. I stopped in and was able to chat with Nichols, who shared the story behind the company. Naturally, I was curious about the coffee side of the business, so I asked Nichols to share his story too. Originally, from the D.C./Northern Virginia area, Nichols came to Portland in 2007. With a degree in geology from the University of South Carolina, Kevin worked in an environmental testing lab, but he found his job unfulfilling (being holed up in a lab all day did not lead to much human interaction). Outside the lab, he discovered for the first time that coffee could taste good. “Coming here, I first noticed all the latte art, and I was just fascinated by it,” he said. Nichols spent a year abroad in London, during which he decided to switch career paths and get into the coffee business. To get a head start on his new life, Nichols took an intensive course at the London School of Coffee that covered a gamut of topics, from roasting to pulling shots to latte art. Back in the Rose City, Kevin found a barista job at Nuvrei, where was trained by Matt Higgins, Coava Coffee’s owner (at that time, Nuvrei was a Coava wholesale account). From Nuvrei, Nichols moved to Water Avenue Coffee. When he interviewed for the Water Avenue position, Kevin was clear about his ultimate intentions. “I was honest with them,” he said. “I said my dream is to open up my own place. That’s what I want to do in the next couple years.” That was fine with Milletto and Smyth, who look to hire employees with enthusiasm for coffee, even if it causes them to lose them when they leave to do their own thing. Less than a year later—much sooner than originally planned—Nichols became a partner in the new business. “I was a little daunted about starting my own place, completely on my own,” Nichols said. “Then this came up—not only the opportunity to work with other people, but to work with friends.” When Nichols told Milletto and Smyth he was leaving to start the new business, they encouraged him to go for it and offered their support. Click here to see a few more photos of the shop. 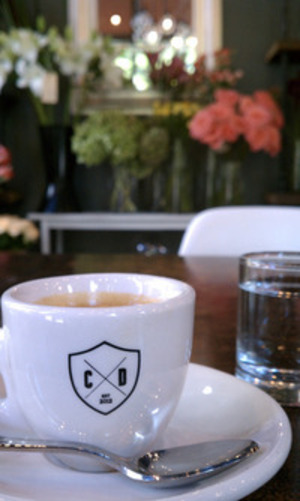 CDExD is the fourth café to have inhabited the Jamison Square location during the five years I have been in Portland, so I asked Nichols how the new business would be successful where others were not. He said the mix of talents and the experience of the owners gave CDExD an advantage. In addition to selling goods and services, the puts on several classes each month, in home decoration, floral arranging, and coffee (Nichols will be teaching a class on how to brew a pourover at home the next one will be Wednesday, October 23, at 7:00pm. Details about the classes can be found on the company website). CDExD does design and flowers for events as well. The diverse offerings are intended to complement each other. Time will tell how the three-in-one model works as a business, but Christopher David makes a pleasant stop in the north end of the Pearl. Between the furniture, the flowers, and the coffee, the shop is like a little bit of Paris in the heart of the Pearl. It combines the elegance of the Champs-Élysées with elements of third wave coffee, such as the low counter and the open coffee bar, where baristas make drinks in full view of the customers. I might never have a living room as nice as the showroom floor, but I will happily sit at a table and enjoy the setting for the price of un café.